TOUR CRAZY – TOUR DE FRANCE 2018: STAGES & RIDERS TO WATCH. - Terry Peloton. 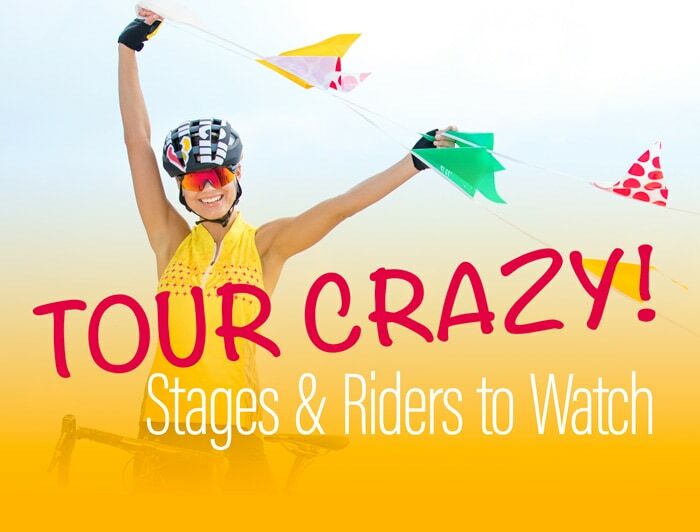 You are here: Home / Sidesaddle Blog / TOUR CRAZY – TOUR DE FRANCE 2018: STAGES & RIDERS TO WATCH. TOUR CRAZY – TOUR DE FRANCE 2018: STAGES & RIDERS TO WATCH. This year the Tour start is on an island on the West coast, in the Vendee region (close to the Loire). The race loops around France to finish on the Champs d’Elysee in Paris on July 29th. The first stage brought a surprising, but pleasing result, as Columbian rider, Fernando Gaviria, left half a length of air between his bike and Sagan’s in the bunch sprint, and steps into the yellow jersey. There’s lots to anticipate, and at this early stage many more surprises are surely waiting for us. Here’s what to know as you watch the race develop. The favorite – Chris Froome was surrounded by controversy heading into this tour, with an investigation into a high test level of asthma medication last year. He was cleared to race a few days ago, but public reaction is still very negative. Details here. Even without that going on, Froome won the Giro d’Italia with an amazing comeback performance only a few weeks ago, and not many riders have accomplished the double. Will he be too tired? Undoubtedly he has the mental toughness required, and is supported by a strong team. Once considered a bit of a dull rider for a Tour champion, he showed remarkable resourcefulness and grit in the last couple of Tours, launching surprise attacks that won the races. Whatever you think, he’s the one to watch. Quintana – suffered a setback in the opening stage with an unfortunately timed flat, but a brilliant climber with a great team. Don’t count him out. Valverde – Quintana’s team mate could be the alpha depending on how their performances shape up. He has the legs to win in the mountains. Bardet – young French rider of great talent and courage, getting stronger each year. Nibali – a previous TDF winner, who gets stronger in the third week and has a strong sense of strategy. Porte – rode for years in support of Froome, and proved he’s capable both physically and mentally. Now he’s leading a new team he may have the chance to prove himself. The great sprinters: Greipel, Kittel, Cavendish, Debenkolb, Kristoff, Boasson Hagen: amazing power and prowess from all these guys in the right conditions. Cavendish – closing in on Eddy Merxc’s record of 34 TDF stage wins. He needs 4 to tie, and won 4 stages in 2016. Keep an eye out this year. This year the tour stays in France, except for a minor excursion into Spain in the Pyrenees, late in the race. The route begins on the West coast, and sweeps up to the North for a series of flat or only moderately hilly days, which favor the dramatic bunch finishes where the sprinters shine. Great fun to watch! In a change from most previous years, the route takes the riders into the Alps in the East, bordering Switzerland and Italy, before heading to the Pyrenees in the South West, bordering Spain. Usually the riders are severely tested in the Pyrenees before heading into the classic climbs of the Alps, which always seem longer, harder, and more strategically decisive in the later stages of the race. More than the change in sequence, this year’s route is tougher because it includes more days of harder mountain climbs than usual – long, grueling days where riders are pushed to their limits of strength and endurance – over and over. This year also includes parts of the infamous Paris-Roubaix route, which tests riders and bikes in other ways. Those who cannot maintain top speed through the constant battering of miles and miles of often muddy cobblestones may lose a lot of time here. Individual and team strategy is always a crucial part of the Tour de France, and is fascinating to follow. This year, individual time trials, a team time trial, the brutal cobblestone stage, and any of the serious climbing stages, will be the places to watch riders attempt to gain big time advantages. One of the early days with serious mountain climbing on this route, takes in the famed Alpe d’Huez, with it’s legendary hairpin curves, and which has been the key climb of the race in many Tours. An unusually short stage, packing 3 serious climbs. Riders will have energy and motivation: expect fireworks. The individual time trial on the next to last day could give someone an opportunity to leapfrog the overall standings at the last minute. Not so dramatic to watch unless you’re an enthusiast, but this could be a decisive day for the Tour. What’s the best way to follow the Tour de France 2018? Podcasts and live streams are a great way to miss not a moment – see a couple of favorite options here. NBC has the broadcast rights in the US, and offers an app that does a great job of keeping you in the moment, with live coverage and lots of stats. If you don’t want or need to shell out fifty bucks for the app, the official Tour de France site is a great alternative. We’re mostly bike and/or race nuts here at Terry, so it’s hard not to be immersed in the Tour. The live feed coverage is a great way to keep a handle on the progress of the race and still get your work done – not as immersive as video but you can still experience the drama and strategy as the stages unfold.